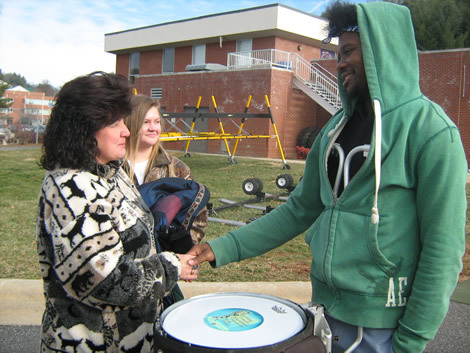 Justin Holmes, a sophomore who plays snare drum in the Western Carolina University Pride of the Mountains Marching Band, greets Beverly Pruett (left), whose son Billy Epley played snare drum in the band when he died in 2005. 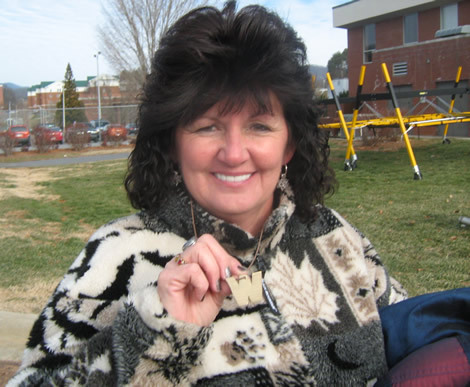 Beverly Pruett holds up the "W" made out of cymbals that the Western Carolina University Pride of the Mountains Marching Band's percussionists presented her in honor of her son Billy Epley, who played snare drum in the band. Epley died in 2005 between his junior and senior year at WCU. 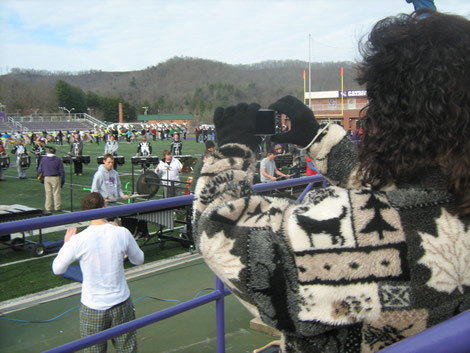 Beverly Pruett, a Forest City resident whose son Billy Epley was a member of the Western Carolina University Pride of the Mountains Marching Band when he died in 2005, takes pictures at the band's last rehearsal before the group performs in the 2011 Rose Parade and Tournament of Roses Bandfest. Beverly Pruett and her daughter Linita drove from their home in Forest City on Monday, Dec. 20, to Cullowhee to watch the WCU Pride of the Mountains Marching Band at its last rehearsal before traveling to California to participate in the 2011 Tournament of Roses Bandfest and Rose Parade. Pruett’s son Billy Epley was a member of the band who played snare drum when he died in a traffic accident in 2005. One of the five stars on the flag the band will carry in the parade honors him. Epley, who started to play drums in sixth grade, practiced and practiced in order to make the drumline and play snare drum at WCU. Pruett said she would come to the games to watch when he was at WCU, and she still comes today because they meant so much to her son. The band will honor Epley in the 2011 Rose Parade as well as four other students who died while they were members of the band by carrying a flag. Stars on the flag represent Epley, Melanie Thompson, Megan Hayes, Mandy Buchanan and Daniel Ledford.